Our warehouse facility is large enough to store many families belongings after a fire has destroyed their home. After a severe fire, families often have to stay in a hotel while their home is being cleaned and rebuilt. Their belongings are brought to our facility and cleaned to preloss condition and then boxed up and stored. Before disaster strikes your building, call one of our SERVPRO marketing representatives to perform an Emergency Ready Profile (ERP) to your facility. It is a FREE assessment of your building to help clean up and restore your building from a water or fire disaster, saving you time and money. SERVPRO of Northwest Stark County has crews that are ready 24 hours a day, 7 days a week to respond to any size fire and water restoration and cleanup. Call us today! Our SERVPRO of Northwest Stark County crews are available 24 hours a day - 7 days a week. We know how important it is to dry out and restore your home as quickly as possible after a water loss. Our crews are trained and IICRC in water damage restoration. Call us today at 330-497-4600. 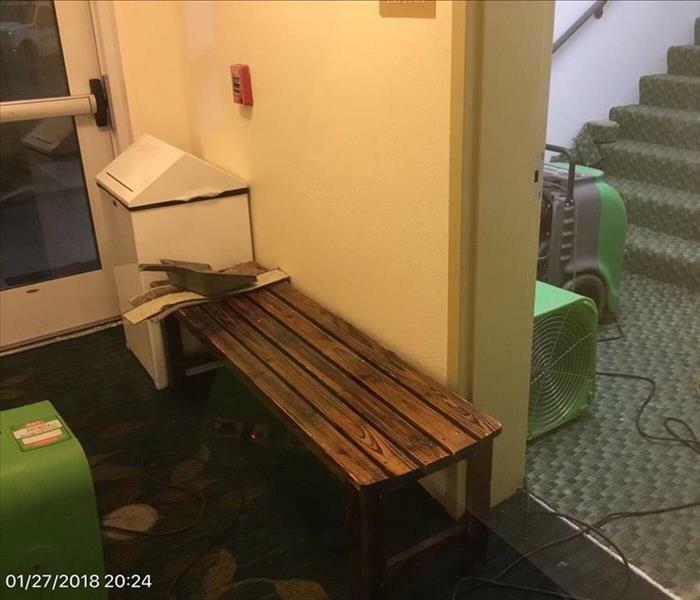 This is the aftermath of a sprinkler system malfunction that occurred in a hotel. 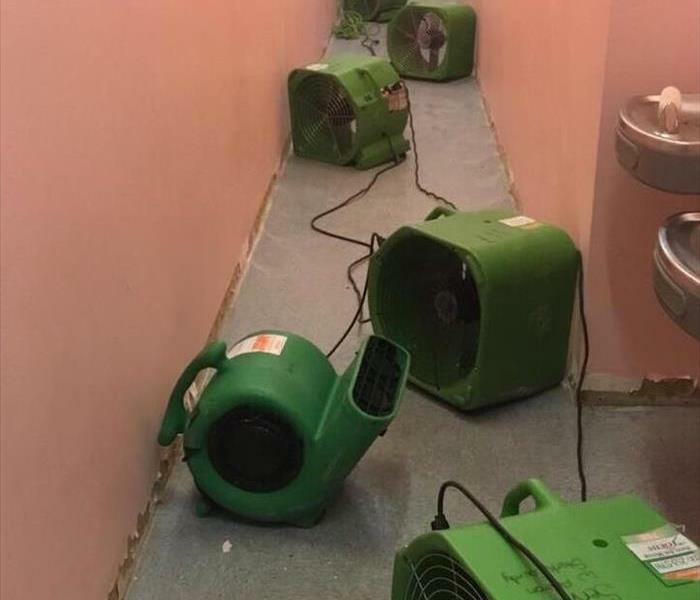 Our crew arrived and extracted the water from the affected hallways, rooms and stairwells, we strategically placed drying equipment to ensure the structure dried as quickly as possible. No job is to big for SERVPRO of Northwest Stark County. 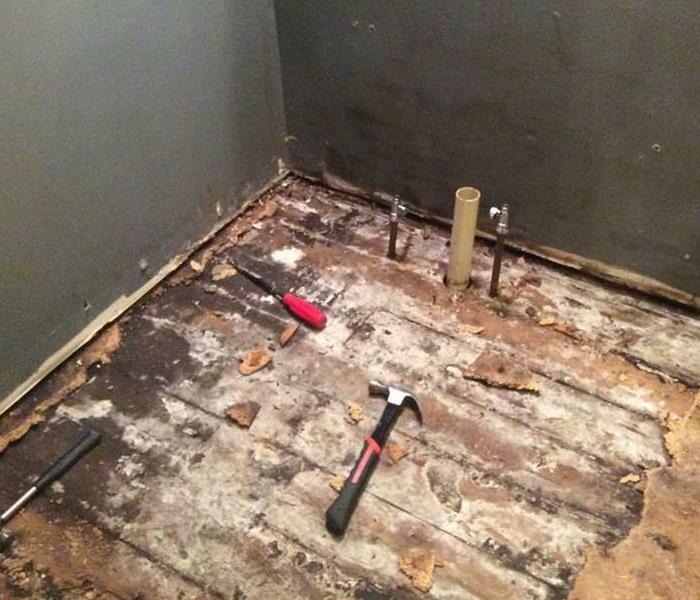 These kitchen hardwood floors were damaged by water in a Copley home. Hardwood floors can be saved if they are dried quickly after being wet. SERVPRO of Northwest Stark County was called out right away. By arriving quickly we were able to extract the water and begin using our inject a dry drying equipment to begin the drying process. This utility room suffered from significant water loss after a pipe break. SERVPRO responded and began extracting the water from the floor. The air movers were put in place for quick drying. This bathroom suffered from a water loss. 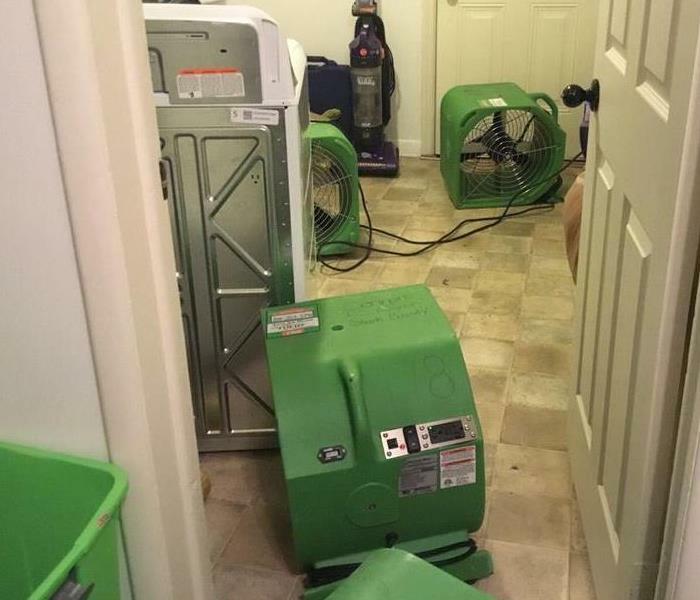 SERVPRO responded and began mitigation. There was significant dirty water and flooring damage. The air movers were put in place to dry the area quickly. 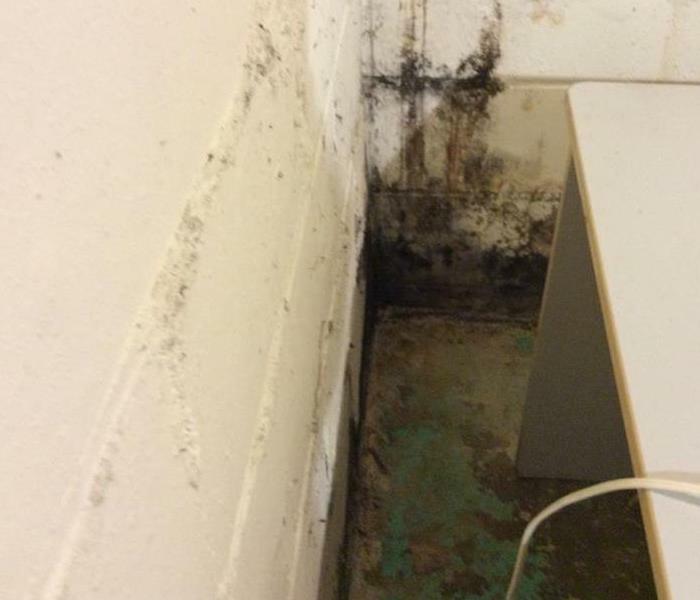 This office suffered from significant water damage causing mold and mildew to set up on the wall and floors. 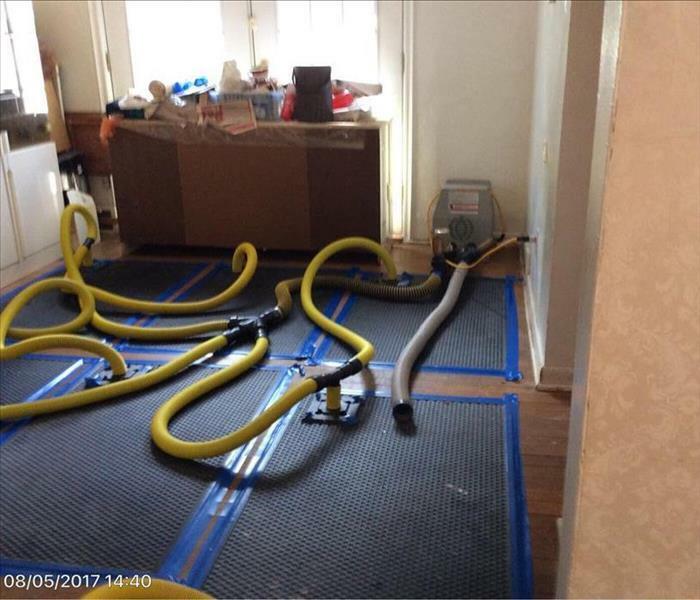 The team at SERVPRO responded and began remediation. The mold was removed and restored back to pre mold conditions. This basement had too much moisture and the walls started to grow mold. It used to be carpeted and have a drywall ceiling. All had been removed in order to rid the place of mold. 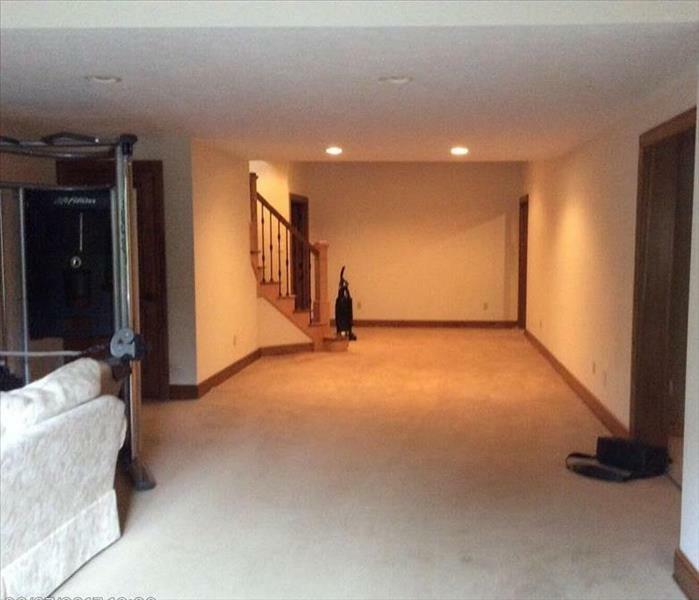 This Jackson Township home had some mold growing on the carpet and along the baseboards. Mold usually takes 48 hours to grow which was about how much time the family was away on vacation. A water damage is bad enough but when mold is present it becomes a much bigger job. All the carpet and moldy materials need to be removed. 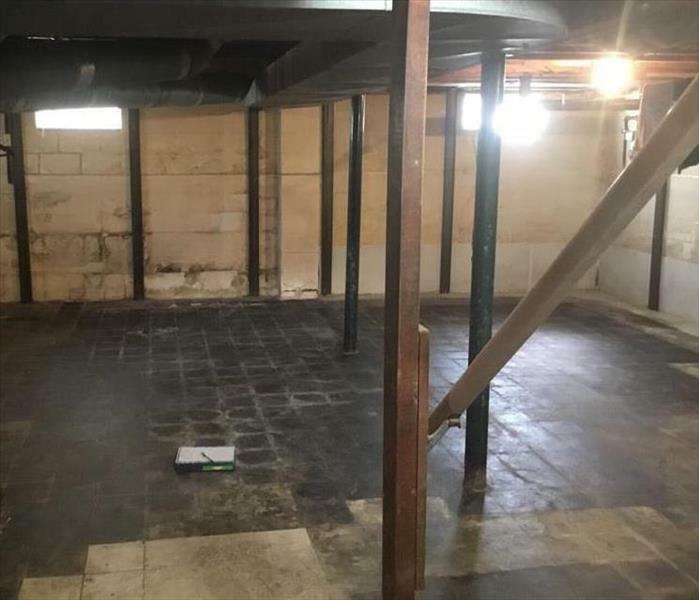 This picture is of basement after all the mold was removed. Bathrooms are notorious for flooding. SERVPRO of NW Stark County cleans up after these damages often. Our technicians are certified to clean up after sewer and water damages in your commercial property. This basement was full of water at one point if you could believe it. We love cleaning homes after storm damage. "Like it never even happened." is our tagline and we lived up to it here. 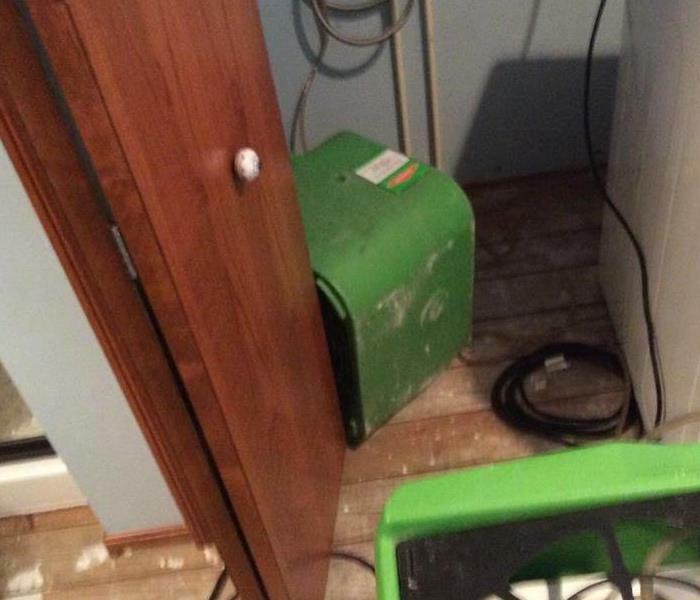 This hallway in Lake Cable, OH, is part of a business that had a supply line break. They called SERVPRO of NW Stark County to get their place dry once more before they opened for the week. The mold growing along the baseboards is unfortunate. Finding the cause of mold was difficult as the water was not on the carpet but in the wall from a leak in the roof. This bathroom had a leak come from the ceiling. The picture shows our air movers aimed at the ceiling to help dry it out. The ceiling tiles were replaced after the area above the dropped ceiling was dry. These beautiful wood floors were not here before. 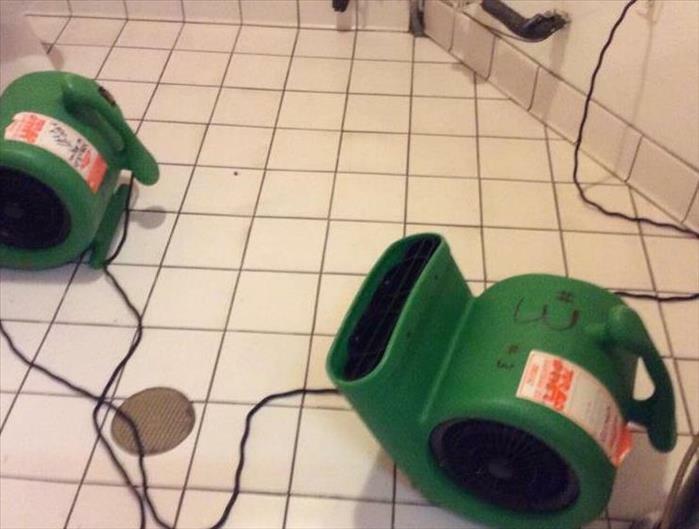 They needed to be replaced because a storm blew through which flooded their neighborhood. The floor and cabinets needed to be redone but the finished product looks great. The rain water flooded this house when the drain backed up outside. The floor didn't get too wet but enough damaged was done to merit a good cleaning and some air movers. Call SERVPRO of NW Stark County for all your storm damaged needs. This home was a triple threat when it comes to home restoration. It started out as a fire, the fire fighters hosed the place down making it all wet, and then mold started to grow. Overtime the wax seal on a toilet will dry out and cause water to leak when it is flushed. The trickle of water caused mold to grow underneath the hardy backer on the subfloor. Water came through this home after heavy rains and wind destroyed the roof. Rain water ran down the inside of the walls causing the paint to chip and the concrete to fall off. 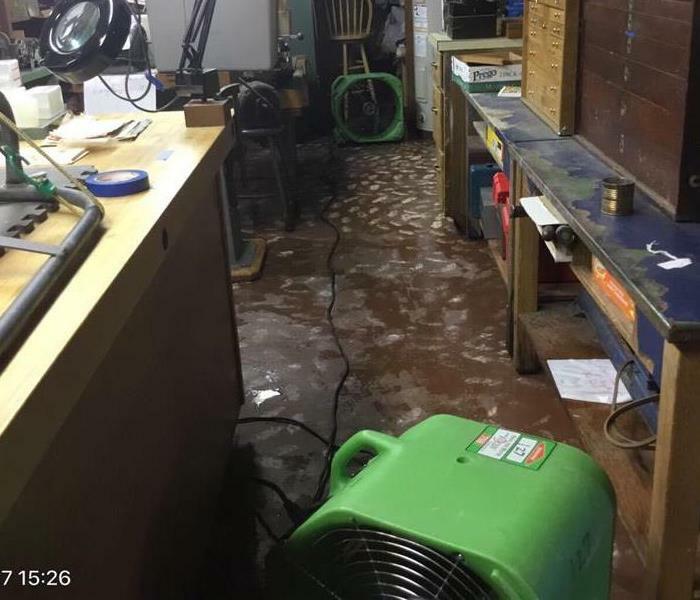 The flooding in Massillon ran into this Workshop which saturated the flooring. 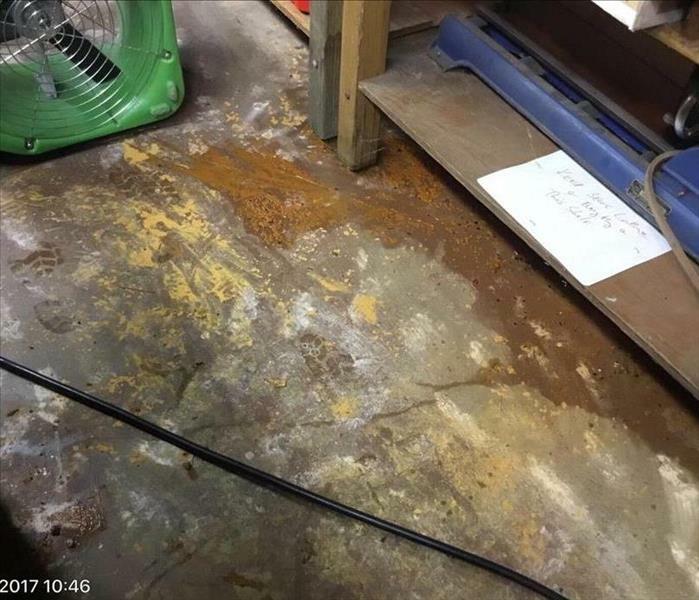 The flooring was removed to keep bacteria from growing within the workshop. The place was disinfected and ready to be dried for new flooring. The toilet overflowed in this bathroom which was covered in carpet. You read that correctly, we still find carpets in bathrooms. The insurance agent and adjuster were able to convince the homeowners to change their carpet to tile now that it needed to be removed. Most wood floors are raised in order to create breathability. Wood moves throughout the year depending on the humidity, heat and coldness. This is a picture of what the wood floor looks like underneath as it tis getting ready to be removed. The supply line of this washing machine broke and flooded. Supply lines are the most notorious problem we encounter. Little do people know that many supply lines have warranties that the insurance company will subrogate against. The ceiling within this entryway started dripping and falling apart. The water was getting in when it rained because of a bad seal above the entryway awning. All the water moved toward the back of the awning saturating the ceiling which needed to be removed and dried. 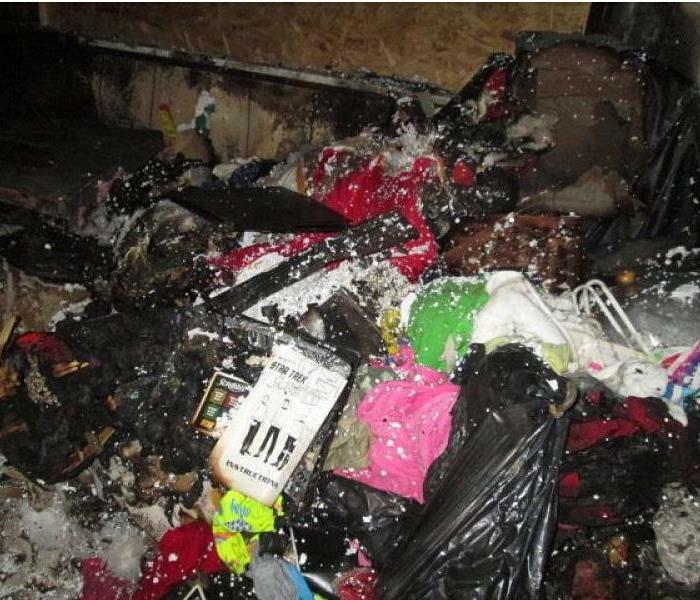 This home was damaged by soot and smoke after a fire started on their stove. The damage was very extensive and it took a few days to clean. The homeowners were very happy with the work that was done and their clean home. The electrical fire that started in this bathroom left a lot of soot behind. It was mainly drywall and some plastic material from the shower curtain but it did leave piles of residue throughout the bathroom. Leaving grease on the stove is a common way that fires are started. Many people leave oil or grease on the stove to heat for frying. However, the distractions of cell phones are usually the reason for neglecting the hot oil until it burns. The smoke is clearly visible coming out of the kitchen where the fire originated. The smoke left behind a residue right outside the doorway. The soot will be able to be cleaned but it will also need new paint. Content is a fancy insurance word for stuff within the home. It is not bolted down in anyway and can usually be cleaned at our facilities. We will go through the items to salvage what can be cleaned. 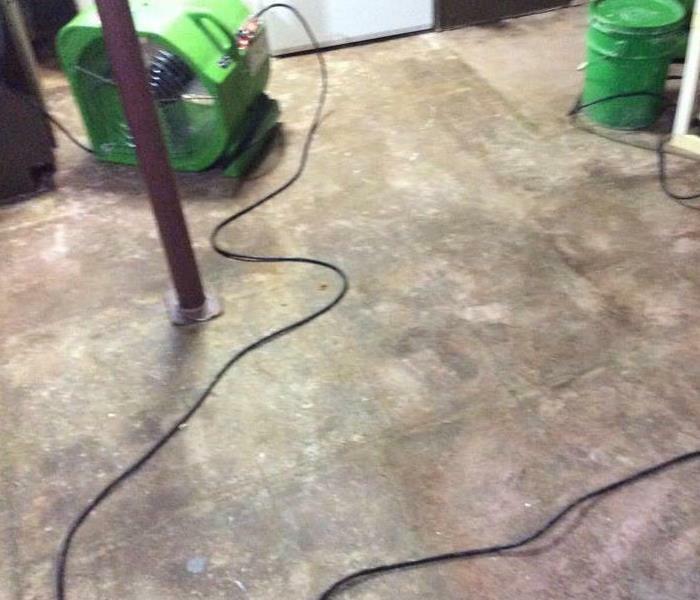 The flooding in this workshop had to be cleaned before the workers were able to return to work. Their machines use a lot of electricity and it was a dangerous until the water was removed and the machines were dry. 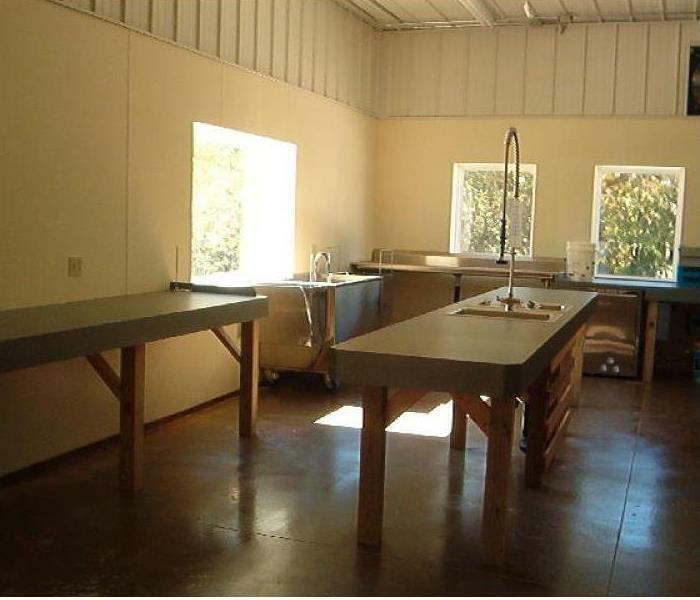 This kitchen had been damaged over years of being vacant. Another company had bought the building and called SERVPRO of NW Stark County to clean it before they started operating it once more. Wood floors can buckle and cup after water intrusion. 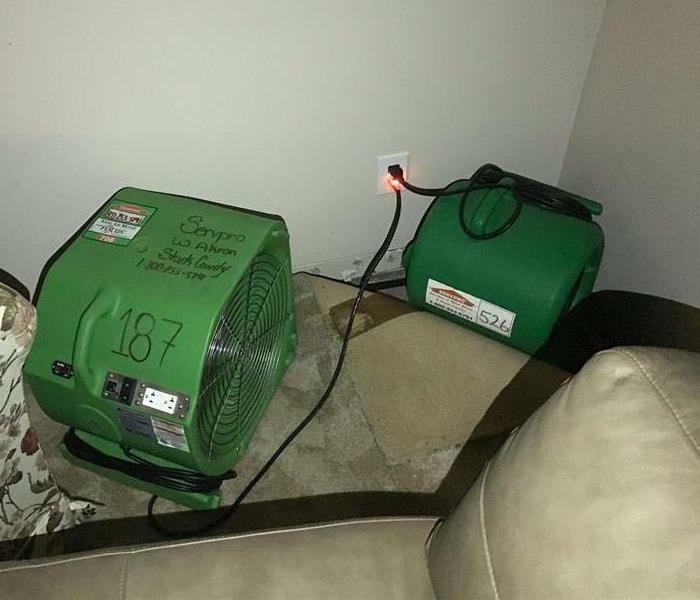 SERVPRO of NW Stark County has the knowledge and equipment to save wood flooring from water damage. The mat system in the picture is extracting water all the way from the grooves underneath. 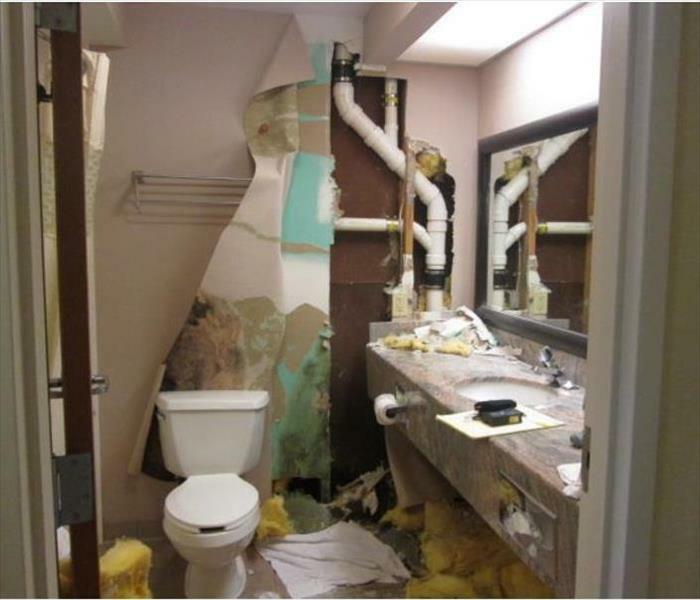 This hotel was destroyed after a water pipe broke through the wall. Water and drywall was everywhere. We were called to come do the cleanup. The main concern is to keep mold from growing in the wet wall cavity. This attic caught fire because of an electrical wire malfunction. I didn't do too much but burn some of the structure and cause a lot of smoke. The smoke smell was throughout this Lake Cable home. Smoke Damage cleanup is one of our specialties. Follow the link to read more about smoke damage. Aftermath of a kitchen fire in Canton, OH. The fire burned very sporadically in this home. There were ashes that fell to the floor which ignited the only one part of the wrap around bar. Al will need to be removed and restored. Willing to work in any conditions! SERVPRO of NW Stark County is willing to work in any conditions. This home suffered a water damage from a broken supply line in the kitchen. It wasn't until we arrived that we realized that the home was owned by a hoarder. SERVPRO of NW Stark County has enough trucks and personnel to help during a big storm. Storms can cause many homes to be damaged. Nobody wants to be placed on a waiting list. Call SERVPRO and get your home back. Our SERVPRO of NW Stark County highly trained crew members always enjoy working together to help families get there fire or water damaged homes back to "Like it Never Even Happened"! The SERVPRO marketing team of NW Stark always enjoys having a great time entertaining our wonderful customers! This summer we enjoyed hosting 300 guests at a Akron RubberDucks baseball game! 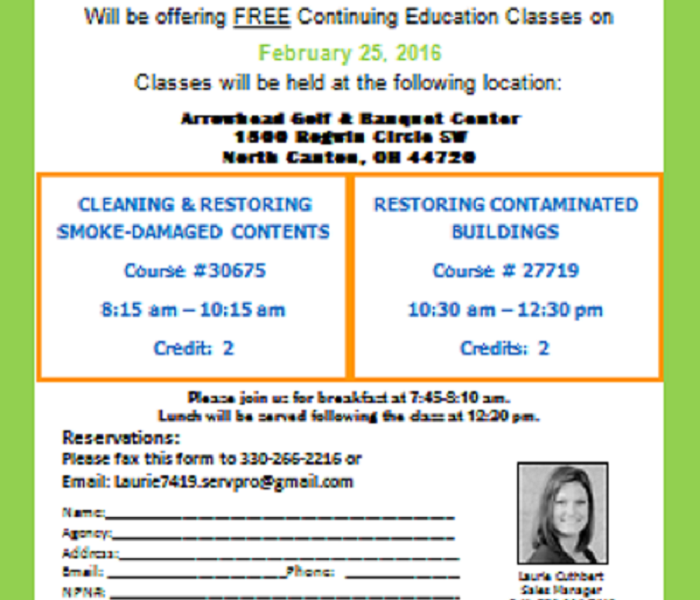 Please join us for FREE CE classes on February 25, 2016 at the Arrowhead Golf and Banquet Center in North Canton Ohio. Any questions please contact SERVPRO of NW Stark County today at 330-497-4600 to register. Look for our NEW SERVPRO signs in your neighborhood. Signs are being held by our Crew Chiefs: Heather & Joe! Call SERVPRO of NW Stark County today if you have a fire or water damage 330-497-4600. We have a new truck for SERVPRO of NW Stark County! Please call us today if you have a fire or water damage to your home in Stark County Ohio. 330-497-4600!